Big news! 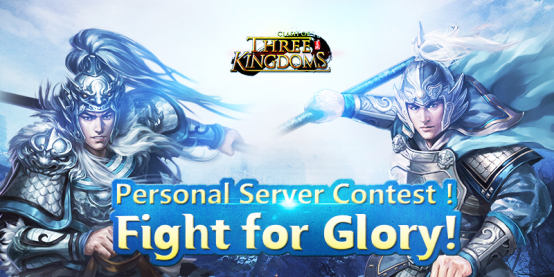 Here comes our brand new Personal Server Contest. The rewards are fully improved to a new fascinating level. For players who are ranked in TOP 16 can get Pearl Case Fragment which can make one Pearl Case with 20 case fragments after the Super Tournament. What are you waiting for? Come and win big rewards! Opponents will be selected and arranged automatically by system based on the points of participants. Players who join the Personal Server Contest for the first time will be ranked from top to bottom based on the level of their characters. And then meet their opponents selected by system automatically. Each player is allowed to participate in 5 matches everyday for 3 consecutive days which totals 15 matches. Players could open the registration page by clicking the event icon in the main interface. Then click the ‘Registration’ button to sign up for the Contest. Players are allowed to sign up 48 hours earlier before the Contest and the registration entrance will be closed 10 minutes earlier before the match starts. Players could check the points ranking by clicking the entrance of the contest after all five-day matches end. When the countdown clock hits zero, players could click the ‘Contest’ icon to start the Contest. Players could claim vouchers as rewards in the ranking interface after the Contest ends. 1) Ranking points will be calculated based on the results of single contest and the number of vouchers will depend on both the results of the contest and voucher double. 2) At the end of this contest, players could claim voucher as rewards in the interface of points ranking. 3) After the Contest, players who rank top 3 of their countries in that server will be awarded with title of No.1/No.2/No.3 Warrior.